After a great recent performance at Matt and Phreds in Manchester, the band have two gigs that are much closer to home. To help get you into the festive spirit, we have two Christmas concerts coming up. 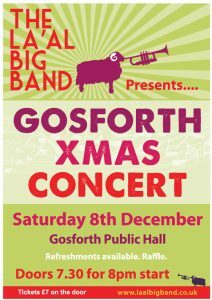 The first is in Gosforth hall on Saturday, December 8. Doors open at 7:30pm for an 8pm start. Refreshments will be available and tickets cost £7, available on the door. 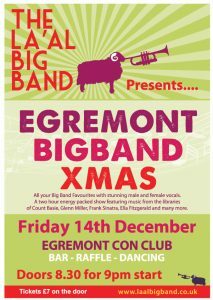 The following week, on Friday, December 14, the band are making their first appearance at Egremont Conservative Club. Doors open at 8:30pm for a 9pm start. Both performances will feature big band standards, interspersed with some festive favourites!